This week was a nice week for the ladies of the Eastern Kentucky Super Region. Krista and Kailee Perry placed their names on the leaderboard for the state in the 300m hurdles and 1600m run respectively. The Mason County girls team were the 2019 GRC Heavy Metal Throw Down team champions beating the likes of Madison Central, Lafayette, and Western Hills. We will start with the season opening victories for Kailee Perry. The class AA state runner up in cross country came out at the GRC Heavy Metal Throw Down and put the state on notice. She demolished the field in the 1600m with a respectable 5:11.57. While this is still 7 seconds off of her PR, for a late March time, I am sure Kailee is satisfied. That race featured the defending class AAA state cross country champion and KYtrackXC 5K Showdown champ in Ciara O'Shea. This was a great win for Kailee only be followed with an equally impressive 800m 2:23.82 which is the 7th best time run by a girl this outdoor season. Kailee Perry's season opening 1600m placed her atop the state leaderboard for that event. The successes this week were not limited to Kailee. The Mason County girls squad took home the GRC Heavy Metal Throw Down team title over Lafayette 90-72. The most impressive part of this team victory was they did it with only one individual champion in Abigail Dawson's 9'5" pole vault. Numerous event runner up finishes propelled the Lady Royals to the title. 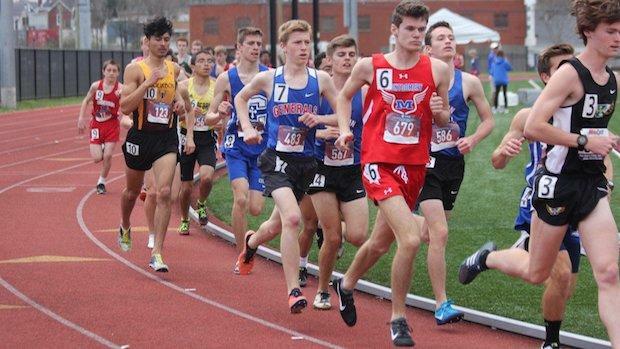 Outside of the GRC meet, the BRAG Meet hosted by Russell produced a number of top marks from the Eastern Kentucky Super Region. Ashland Blazer took advantage of a great day of competition by winning the 100m dash with Lillian Sebastian, 400m dash with Kate Reese, 3200m run with Rebekah Howard, 4x200m relay, and triple jump with Angelina Patel. That is what we call a total team effort! The throwing events were a highlight at the BRAG meet with Gracie Opell of Boyd County winning the shot put with a toss of 33'9" and Lauren Hannah of Greenup County winning the discus throwing 98'11". These were the top two performances of the week from the Super Region, and placed both ladies in the top 20 in the state in the respective events. Lastly, but certainly not least, Promise Cross of Rowan County came out and jumped herself to the top of the state leaderboard. Her 5'6" high jump is 4 inches above the next best jump so far this outdoor season. Even more impressive is that jump is the 42nd best jump in the COUNTRY this season. It was a PR for the junior but could have been more. 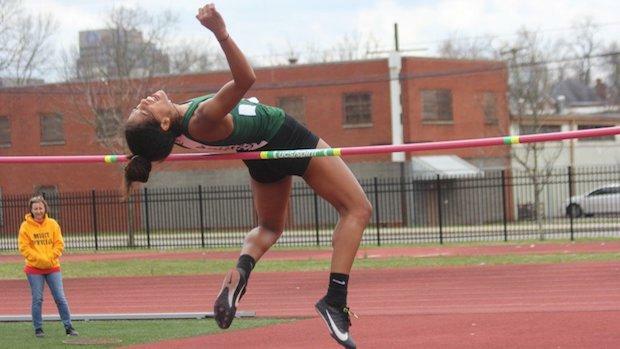 She narrowly missed her attempt at 5'8" which would have placed her at #14 nationally. Well, Ashland Blazer boys have placed the Eastern Kentucky Super Region on notice. Led by the sprinting power of Keontae Pittman and supported by top marks from all other disciplines, these gentlemen had quite the week. Sophomore Keontae Pittman had the top mark of the week in the 100m 11.46, 200m 23.46, and the 400m 51.58 all taking place at the BRAG Meet. As the first meet of the season, these were not PRs for Pittman, but they were not too far off his best. The top marks continued for Blazer in the hurdle events with Isaac Caines and Nana Amo-Mensah taking the 110m hurdles and 300m hurdles respectively. Senior Ryan Bryant was the top shot put thrower in the Super Region this week with a PR toss of 50'3" and #3 in the state. Upstart Middlesboro had a week with wins in the 4x200m and 4x400m relay. They were also the runner up in the 4x100m relay to another up and coming program in West Carter. The boys from West Carter took on the big dogs at the GRC Heavy Metal Throw Down and showed they are a force with a second place finish and a time of 45.31. That runner up finish along with other top 8 finishes, placed the West Carter boy's team in 7th at the meet. West Carter boys were second in the 4x100m relay behind state leading St. Xavier. For the distance events, it was a hodgepodge of runners that took the weekly title. The 800m was owned by Isaiah Caperton of Boyd County with a 2:09.89 and 3 seconds ahead of the next best mark for the week. In the 1600m, Brandon Cox of Bracken County had a solid run of 4:45.12 at the Harrison County All Comers. Lastly, Montgomery County's Jarrett Forrest was dominant in the 3200m as he took 6th at the GRC Heavy Metal Throw Down and had the best 3200m time at 10:29.25. The top jumper for the week was Kaleb Darnell of Bracken County who leapt 19'5" in the long jump and 41'5" in the triple jump. Both of these marks were the best by about a foot when compared to other jumpers in the Eastern Kentucky Super Region. When we move to vertical jumps, the Standfor Walker of Russell has established himself as the best jumper in the area as well as one of the best in the state. He currently holds the top jump in the state at 6'4" (tied with three others at that height). That 6'4" jump was his PR and bested his previous best of 6'0". To round out the jumps, Thomas Skaggs of Ashland Blazer had the best pole vault of the week at 11'3" at the BRAG Meet.